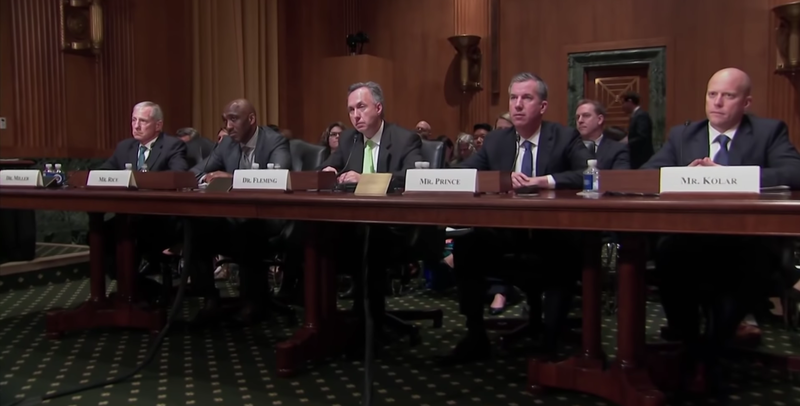 Pharmacy benefit managers (PBMs) were challenged by the US Senate Finance Committee on their pricing practices yesterday, but laid the blame on pharmaceutical manufacturers. The third hearing convened by the committee heard testimony from senior figures at CVS Health, Prime Therapeutics, Humana, UnitedHealth Group's OptumRx unit and Express Scripts parent Cigna, and comes after earlier meetings that grilled patient representative groups and pharma industry CEOs. The pharma executives directed the blame for high drug prices squarely at the PBMs during their time in the spotlight, claiming that discounts and rebates were not being handed on to patients and the PBMs as middlemen were pocketing the savings. Doing away with rebates is one of the main elements in President Trump’s plan to reduce drug prices, and the PBMs – often referred to as the ‘middlemen’ in the drug supply chain as they negotiate drug prices for health plans – are concerned that approach would wreak havoc with their business model. Yesterday, the PBMs struck back, with Humana’s president of healthcare services William Fleming telling the committee – led by Republican Senator Charles Grassley and Democrat Senator Ron Wyden – that manufacturers set the list prices and raise them to boost revenue. In some cases that can occur at unsustainable rates, thanks to a lack of competition, he argued. Fleming also said that only 255 of the drugs covered in Medicare have rebates, which is equivalent to around 7% of all products covered in Humana's Medicare plans. Rebates are in fact a powerful tool to curb excessive price rises set by the manufacturers, asserted the PBMs, pointing to the escalation in the cost of insulin products in recent years. That specific topic is being tackled by a House Energy and Commerce hearing today that could be lively, as it will have both PBMs and insulin producers in the same room. “We know consumers have felt the manufacturers' list price increases in the form of higher out of pocket costs,” said OptumRx CEO John Prince, who insisted that his company passes on 98% of rebate savings to its customers. Critics argue however that the rebate system creates an incentive for drugmakers to raise prices to offer bigger discounts, while PBMs are incentivised to include more expensive medicines in plans as they keep a cut of the rebate for themselves. The PBMs also cited “pay for delay” and other anti-competitive practices in the pharma industry such as withholding samples from generic manufacturers and tweaking formulations to extend patent life among the reasons for high prices. On balance, it seemed the senators were not swayed by the PBM arguments, and the committee has asked for more granular data on rebates received from drugmakers and passed on to health plans in a bid to inject some transparency into the investigation. They also want more information on ‘spread pricing’, in which PBMs are said to charge different prices for different payers for the same drug. On the other hand, there was some support at the hearing for the view that focusing on PBMs plays into the pharma industry’s hands, and that Trump’s focus on rebates threatens that industry whilst allowing drugmakers to continue as they have always done.